"What goes on you, goes in you." This truism is based on the fact that your skin is not only your largest organ, but your largest organ of ingestion. You breathe through your skin—if you are 100% covered with grease or grease-based makeup, you will suffocate even while gasping for breath. You take in minerals from a bath, which is why people soak in hot springs or Epsom Salts. And if you soak in poison, or rub it on your body, your skin absorbs that, too. Plus which, toxins absorbed by the skin are not filtered by the kidneys and liver as they are if they've been eaten. So it's really important to avoid putting toxins on your skin if at all possible. And that includes your scalp. Big Pharma, which includes the makeup and personal care industry, is not exactly known for its excessive honesty to its customers. We know about their products that occasionally cause, as a side effect, instant death. Products such as Fen-Phen, Zyprexa, and Adderall all list "sudden death" as a known side effect. In fact, in the case of Fen-Phen, that was apparently its only effect, making it only suitable for prescriptions written by Dr. Kevorkian. So it shouldn't really surprise anyone that there are poisons in the most common and popular hair and personal care products. They aren't deadly poisons—that is, they won't kill you instantly if you get any on you. But their effects are gradual, building up over time, causing obesity, reproductive woes, skin and hair problems, and, eventually, cancers. So, yeah, you might want to look for alternatives. 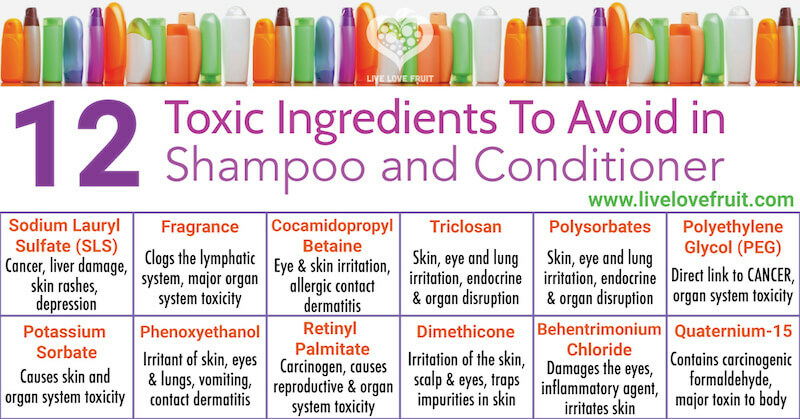 There are more than ten toxins used in most shampoos. I will bet they're in yours, unless you have already cleaned them out of your bathrooms. This list of the Top 10 hair shampoo toxins has been sourced from official government and chemical databases. These include CDC (Center for Disease Control), FDA (Food & Drug Admin. ), EPA (Environmental Protection Agency) and Scorecard.org (Pollution information). 1. IODOPROPYNYL BUTYLLCARBAMATE Reproductive system toxicity. 5. PARABENS Reproductive system toxicity. 8. TOCOPHERYL ACETATE Immune toxicant. 10. DISODIUM EDTA Penetration enhancer. You should never let anything get on your skin that hurts your eyes. Every little kid knows that instinctively. It takes years of indoctrination by our parents to get us used to the idea that these harsh chemicals are "good for us." The thing is, you don't have to risk your life in the pursuit of clean hair. There are non-toxic alternatives and they aren't even expensive. So, why aren't all shampoos non-toxic? Simple: Big Pharma would rather save a penny per bottle on cheaper, artificial ingredients than admit by changing the formulas that they might have been guilty of killing your mother by contributing to the formation of her cancer. Fine. You can easily ignore them, because the alternatives are easy to find. But you have to be careful. The first place I looked was Hi-Health. (That was before they starting paying Sean Hannity to promote their wares; I no longer shop there.) I told the sales guy what I was looking for; he led me directly to a bottle of Jason shampoo. I carefully read the list of ingredients; none of the items on the list above were there so I took it. (And, I must add, I like the shampoo.) It was a bit pricey, though. But, while I was there, and heady with success, I also bought what I thought was going to a non-toxic bath gel. It was on the same shelf, and bragged in big letters how "natural" it was. It wasn't until I got it home that I discovered that its main ingredient, after water, was the dreaded Sodium Lauryl Sulfate. But today, after lunch together, Michael and I stopped by Trader Joe's. I had never gone shopping there specifically for organic products, since this is a new thing for me. But we went hunting, and, sure enough, there were Trader Joe's house brand shampoos and conditioners and shower gels and even toothpaste without any of the toxic ingredients. There was even dish detergent! And the prices were equivalent to those of the toxic, bargain brands I used to buy. Now, if you're like me, you might wonder what these toxic chemicals are used for. How did they get into our personal products to begin with? Essentially, all shampoos and shower gels, as well as dishwashing liquid and laundry detergents, fulfill the purpose of soap. And the purpose of soap is to remove grease and oils from a surface that wants to hold onto them. Oils are made up of non-polarized molecules. That means, They do not hold an electric charge. They will, therefore, easily attract other non-polarized molecules. Water, on the other hand, is made of polarized molecules. That is, the famous H2O molecule is electrically charged; and so it repels oily, fatty, greasy molecules—hence the saying, "oil and water don't mix." If you try and wash your clothes, or yourself, in plain water, you'll remove the water soluble substances, if any, but not the greasy stuff. Thousands of years ago, humans discovered that certain plant roots, when crushed and mixed with water, produced a sudsy, slippery material that would dissolve grease and oil splotches and allow them to be rinsed away with water. What they didn't understand was the chemical composition of those suds. They were composed of a long molecule that was polarized at one end, but non-polarized at the other! Oils would be attracted to to the non-polarized end, and water flushed past it would attract the polarized end and sweep the combination away. These plants were, collectively, called "soaproots." Later, people discovered that heating an alkaline and fat created soap. By the time of ancient Babylon, a recipe for soap called for ashes, cypress oil and sesame seed oil. The ashes, a strongly alkaline material, reacted with the oils to produce molecules with the required polar and non-polar ends. In 1917, with the raw materials for soap being directed to the war effort (I am picturing banners that read, "Support The War Effort! Send Your Ashes To The Front! "), an artificial soap, or detergent, was introduced in Germany. By the end of the second World War (with another soap shortage), people had become accustomed to buying the boxed detergents instead of simply making their own. And so the multi-billion dollar cleaning products industry came into being, adding another aspect of life that was forever changed by the wars from simple and green to expensive and toxic—benefiting, not people, but the global corporations. Sodium Lauryl Sulfate is a detergent. It's responsible for the sudsing and most of the cleaning attributes of shampoo, bath gel, and the like. This chemical is known by a number of similar names; "Lauryl" is often spelled "Laurel" or "Laureth" and either the "sodium" and/or the "sulfate" part of the name may vary. What doesn't vary is the chemical's harshness when exposed to human skin. So the rest of the chemicals in your mainstream cleansing product, are there to buffer the effect of the SLS on your skin. Unfortunately, most of those chemicals are also toxic. Another chemical that might have caught your attention is tocopherol acetate. Isn't that Vitamin E? How can that be toxic? The FDC Yellow #7 has no purpose other than to make the product look more like you imagine a shampoo should look…whatever the heck that means. Since there are easily-obtainable, non-toxic substitutes, there's no reason to risk your health using questionable products…unless you own stock in Proctor and Gamble or Lever Brothers or one of the other giants responsible for filling our homes with toxic chemicals. And, if you do—shame on you!